We’d love to hear from people across cross-government who use technology guidance regularly. You can get in touch with the team by leaving a comment below. The technical standards team is here to make it easier for departments to find the technology guidance needed to provide the best public services possible. Previous user research on the Service Manual showed that technologists often want to find government technology guidance by topics, particularly as we have a number of different products including the Technology Code of Practice and the Service Manual. These products are aimed at different users but there is potentially an overlap of users who want to access both. 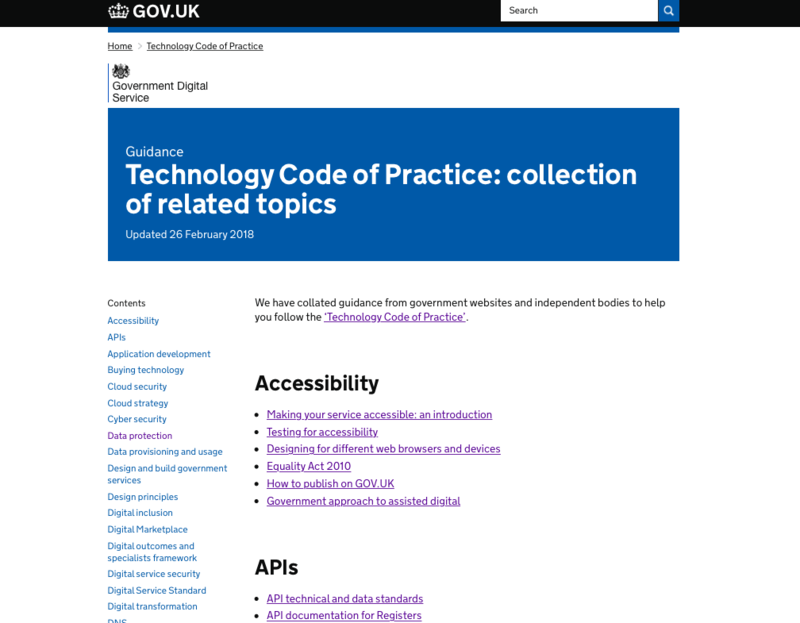 This is why when we published a major refresh of the Technology Code of Practice in September 2017, we introduced a page called Technology Code of Practice: collection of related topics. The topics include areas such as APIs, cloud and security. This collection page holds guidance related to Technology Code of Practice, curated from GOV.UK and the National Cyber Security Centre as well as some content from the Service Manual. To create the collection, we carried user testing with cross-government participants to help develop the topic categories and make it as easy as possible to find the information on the page. The page currently has over 250 pieces of guidance spread across 46 topics, which we are constantly updating. We may add more guidance from the Service Manual depending on our user research findings. Our user research will help tell us if we should develop the collection page into the central navigation of GOV.UK. We will also look into how we can better signpost content and improve the usability of the page. Sign up for email alerts from the GDS Technology blog and get in touch below if you’d like to help us fulfil this mission.